In 2001 a friend of mine gave me a book titled "Studies in Flood Geology" authored by John Woodmorappe, and published by the Institute for Creation Research in 1999. The book is a compilation of some of the papers that Woodmorappe wrote from the late 70s through the early 90s. The book covers a wide range of topics trying to 1) reconcile the geologic record with Noah's Flood and 2) show problems with conventional geology. For example, one chapter is titled "The Cephalopods in the Creation and the Universal Deluge", while another is titled "The Antediluvian Biosphere and its Capability of Supplying the Entire Fossil Record." My favorite is "The Essential Nonexistence of the Evolutionary-Uniformitarian Geologic Column: A Quantitative Assessment." I'm going to address "An Anthology of Matters Significant to Creationism and Diluviology: Report 2. Section IV. Some Examples of "Reworking" Rationalizations for Anomalous Fossils." In that entry Woodmorappe compiles a list of 232 anomalous fossils (fossils that are found in rocks that are either too old or too young – a trilobite in Tertiary strata, for example.) Woodmorappe has a table that lists a) the type of fossil, b) its expected age, c) its actual age, d) the geographic location, and e), the reference. Woodmorappe has a well-deserved reputation for having a lot of references. That doesn't imply anything about the quality of his work, but at least he is thorough. I'm going to take a look at the data in a few different ways. The first thing I'm going to do is to separate the fossils into macrofossils (anything that can be seen with the naked eye) and microfossils (fossils that can be seen with a microscope). The types of macrofossils Woodmorappe found are: brachiopods, trilobites, mammal bones, crinoids, palm wood, ammonoids, fish scales, plant tissue, graptolites, and archaeocyathids. The microfossils are spores, pollen, conodonts, foraminifera, acritarchs, nannoplankton, dinoflagellates, fusilinids (a type of foraminifera), algal cysts, chitinozoans, algae, coccoliths, nannoflora (which I assume to mean fossils of plankton belonging to the plant kingdom), ostracodes, nannofossils, and diacrodians (I must admit I don't know what these are). As you can see 93% of the anomalous fossils reported by Woodmorappe are microfossils. More on this later. Next I want to take a look at the types of anomalous fossils. Most of the anomalous fossils are spores, pollen, conodonts, forminifera, and and acritarchs. Most of the rest of the fossils have, at most, a few reported anomalous occurrences. Here's the final way of looking at the data. The following graph shows how far from their expected range the anomalous fossils are found. Positive numbers mean a fossil is found in younger than expected rocks. Negative numbers mean that a fossil is found in older than expected rocks. 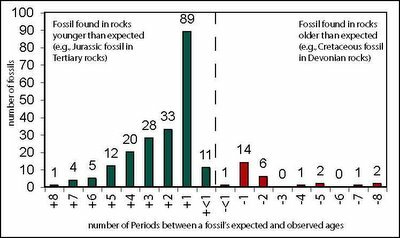 The numbers denote the number of periods the fossil is "out of order." For example a Cretaceous fossil found in Tertiary rocks would have a value of +1 while a Silurian fossil found in Cambrian rocks would have a value of -2. 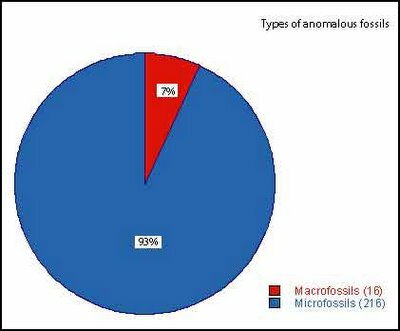 1) Most of the anomalous fossils are microfossils. 2) Most of those microfossils are spores, pollen, conodonts, foraminifera, and acritarchs. 3) Most of the anomalous fossils are younger than expected, and most of those are younger by one Period. "Reworked" and "downwashed" forms are microfossils, it is claimed, because such small forms are resistant to erosion, transport, etc. However, many entries in Tale 1 (References omitted) involve macrofossils." Another explanation is provided by the Creationist-Diluvialist paradigm. Microfossils, being minute, would be less capable of differential escape and be less subject to Flood-water sorting than macrofossils. The common situation of anomalously-occurring pollen and spores may be evidence that all fossil plants were mutually contemporaneous (as indeed demanded by the Creationist-Diluvialist paradigm) but that pollen and spores, being modile, were transported bu wind and water far beyond the restricted ecological zones of these antediluvian plants. In an anomalous coexistence of fossils of different "ages", it is usually assumed that the younger fossils yield the true age of the rock rather than the older ones. This accounts for the relative paucity of "downwash" situations. This table does not include fossils of clearly secondary position (such as fossils within constituents of conglomerates and the very many instances of Phanerozoic fossils in Pleistocene glacial till). But he doesn't say whether or not it includes finding fragmentary fossils, and he really should. Finding a fragmentary fossil certainly doesn't automatically mean that it's been reworked – I've seen plenty of fossiliferous rocks that are composed of broken-up shells, for example. That seems like a really important piece of information to me. I'd like to know, for example, if the anomalous trilobites were composed of intact animals, or if they were just fragments. I'm a little leery of some of Woodmorappe's examples. The most common crinoid (sea lily) fossils, for example, are the small discs that made up their stem. I've seen Mississippian rocks that are composed almost entirely of crinoid stems. Unsurprisingly the detritus that's being eroded from those rocks was composed in large part of crinoid stems. If those same crinoid-bearing rocks were to have been eroded during the Cretaceous (as was the case in parts of Utah, for example), then the Cretaceous rocks would contain crinoid stems. Some reworking should be expected. One or two examples of an anomalous fossil (which are all Woodmorappe has shown for most fossils) aren't evidence of a lack of order in the fossil record. Cretaceous forams found in Tertiary sediments in Utah. Cretaceous forams found in Pleistocene (Quaternary) sediments in Utah. Carboniferous fusilinds found in Pleistocene sediments in Utah. Late Paleozoic trilobite found in Tertiary sediments in Utah. The reason why I think these are reworked is that there aren't any Tertiary marine sediments in Utah, particularly not in the Pleistocene, which was the epoch immediately before the Holocene, which is the epoch we're in now. The geology of Utah in the Pleistocene was basically the same as today, but covered with glaciers from time to time, and a large lake (Lake Bonneville – but that lake wasn't exactly teeming with trilobites – I don't know of any trilobite fossils that were found in Lake Bonneville sediments). Cretaceous pollen in Tertiary sediments in Utah and Wyoming. Jurassic pollen in Tertiary sediments in Utah. Triassic pollen in Tertiary sediments in Utah. Carboniferous pollen in Cretaceous sediments in Montana and Alberta. The reason I'm suspicious of these examples is that the Cretaceous and Tertiary in western North America were times of mountain building, and associated with that uplift and erosion of older rocks, including Carboniferous, Triassic, Jurassic, and Cretaceous rocks. The evidence includes 1) thrust faults that formed during this time, and 2) thick conglomerates composed of clasts derived from those Carboniferous, etc., rocks that were deposited during this time. Woodmorappe does say that he didn't include fossils from conglomerates, but here's the problem with that. Conglomerates are deposited near areas that are being uplifted, grain size decreases as you move away from that area. For example, a conglomerate can be deposited at the foot of mountain, while a sandstone is deposited further away (it's easier to move smaller particles than large ones). That sandstone can certainly contain fragments of older rocks (including fossils). I expect Tertiary rocks in western North America to contain material derived from older rocks. "Down working" refers to younger fossils becoming incorporated into older rocks. I'd expect some of this too. Keeping with the example of western North America, in the Cretaceous when the uplift and erosion I mentioned earlier was occurring, the older rocks that were being eroded (let's say Carboniferous rocks), were exposed at the surface. If some Cretaceous pollen were to be deposited on top of those rocks, and then buried once erosion stopped and deposition began again, and some geologist came along at some point in the distant future and took a sample that sample would contain Cretaceous pollen. I'd expect this scenario to be a lot less common than reworking, and I'd expect it to involve microfossils (I have a hard time imaging how an entire dinosaur could be incorporated in Carboniferous rocks for example), and that's what's seen. 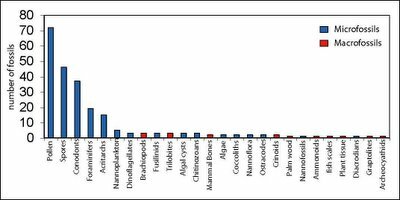 In other words anomalously young fossils ought to be a lot more common than anomalously old fossils, and that's overwhelmingly the case with Woodmorappe's dataset. He tires to explain this by stating that the age of a rock is determined by the youngest fossil within it. An implication of that claim is that rocks are composed of fossils with a variety of different ages, and that implication doesn't hold true. 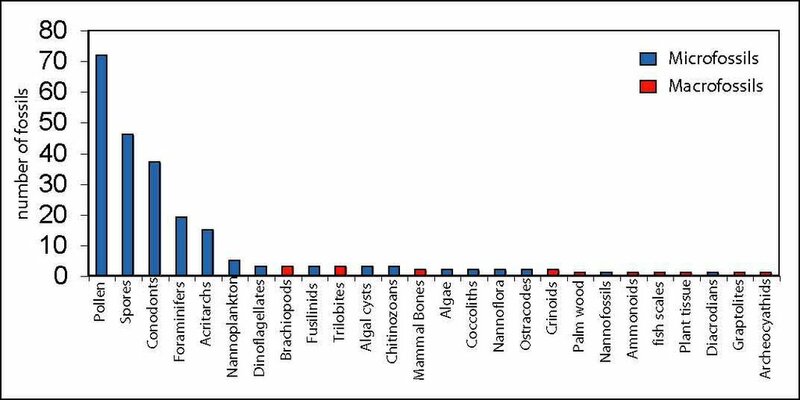 From the third figure I showed, most fossils are displaced by only one period. If the fossils had a wide range of different ages then there ought to be a lot more scatter. At this point it's worth reemphasizing the point that most of Woodmorappe's anomalous fossils are composed of spores and pollen. So, the bulk of Woodmorappe's dataset is composed of spore and pollen that are one period younger than expected. At worst (or at best from a YEC point of view) all Woodmorappe's dataset does is muddy the conventional fossil record of spores and pollen (this is a good point for a reminder that I think most/all of Woodmorappe's references are legitimate cases of reworking). I should point out that I haven't read Woodmorappe's references. I suppose it's possible that the answers to some of my questions are contained within them. In the part of the world that I'm most familiar with though, Woodmorappe's dataset isn't very solid. Henry Morris, who I think can be credited with launching the modern creationist movement, has died. I'd like to express my condolences to his family. While making my morning rounds on the web I came across a couple of articles that deal with the "teach the controversy" approach that's being used by the intelligent design crowd. My view is that biblical creationist begat scientific creationism which begat intelligent design which begat "teach the controversy." Same old material put in a new package in an attempt to disguise its religious origins and motivation (i.e., intelligent design is Creationism's Trojan Horse, or my personal favorite, Creationism's Trojan Panda. Frankly I think the behavior of the Discovery Institute and its Fellows has been deplorable. The first article I read was: Turn out the lights, the "Teach the controversy" party's over by Robert Camp. Q: Regarding the issue of “Intelligent Design theory” vs. current biological consensus on the mechanisms of evolution - is there a difference of professional opinion within your department that you feel could be accurately described as a scientific controversy? There is one faculty member in my college who publicly ascribes to Intelligent Design. No others have done so publicly, and most who have shared an opinion are opposed to ID as a scientific principle. The vast majority, then, do not see a scientific controversy, but there is a visible minority of (at least) one who does. As Camp says in his essay, the overwhelming number of responses stating that there isn't a scientific controversy isn't surprising. There isn't a controversy about evolution within the community of professional biologists. Professors from Washington to Florida and from southern California to New England responded to the question, all but two with an unqualified “No” (some even added an exclamation point). And those two divergent responses serve to point up the open and thoughtful nature of the answers. One, a “No, but…” observed that there was virtually no professional controversy within their department but acknowledged that one colleague had spoken favorably of the concept publicly (see comments). And the only assent to controversy came from an institution dedicated to an ideological view of the world, including the world of biology. This may serve as evidence of a “controversy” in that particular university. But in the larger context, its effect is only to put the overwhelming consensus into sharper focus. There is no party line, there are no knee-jerk responses in the comments received. These results are born of the understanding, among those with authoritative opinions, of where the proper lines between scientific and religious epistemologies must be drawn. Some (see comments) even teach classes that include discussion of “Intelligent Design” but they understand that it is not science, and that there is no relevant controversy. I harbor no illusions that this information will come as a surprise to any scientist, and I suspect most clear-thinking non-scientists will have already surmised the truth of the situation. In discussion of this project I have referred to it as a study or survey, but to be candid it is really nothing more a simple canvassing of those who know. It is a blunt and unequivocal response to what has up to this point been treated, by much of the media as well as the ID movement, as an acceptable assumption. As an attempt to put empirical weight behind that which has been well understood all along, the numbers here are unambiguous. There is no “scientific” controversy regarding “Intelligent Design theory.” It exists as a conceit of personal ideology, and persists as a political strategy. And in the case that the slogan is still employed once the user has been informed of this survey it can be considered a deliberate falsehood. If “Intelligent Design” proponents and theorists wish to carve out space for their “controversy” they will have to earn it in the traditional fashion. They will have to do the research, submit to peer-reviewed journals, and accumulate enough evidence to be spoken of with respect, not dismissal, in biology departments across the country. Until then “teach the scientific controversy” will remain a mendacious bit of hucksterism. There are several worthwhile points in that passage. 1) Professional biologists overwhelmingly accept biological evolution. So does the rest of the scientific community (on a related note I know of only a handful of professional geologists who are Young Earth Creationists). 2) The controversy is between a group of people who don't accept biological evolution because it conflicts with their religious views. Through trickery and disingenuousness they are trying to have their views taught in science classes. 3) The fact that this isn't a scientific controversy is nicely illustrated by the behavior of the members of the Discovery Institute. They're not attempting to convince biologists that they're right (they go after school boards and politicians). They have a publication list that contains 37 entries. This post points out a few problems with that list (repeated entries, inclusion of non peer-reviewed material). According to the Discovery Institute's Center for Science and Culture they have 41 fellows. The Discovery Institute was founded in 1990. 2 articles that are being reviewed by my coauthors before I submit them. In addition I am a coauthor on 3 other publications that are in various stages of preparation, and should be submitted within a couple of months. That makes 11 publications for one person in 3 years. In 16 years the 41 people at the Discovery Institute have put out 37 publications. According to this link the Discovery Institute has an annual budget of $1.2 million. All the money they spend sure isn't going toward science. I think that's a very strong piece of evidence that their claim to be motivated by science is a sham. The second article I read was Teaching the Controversy by Stanley Fish. That's it? They can't even mention their pet guess of Intelligent Design, but instead ask people to sign off on a statement professing the values of skepticism and careful examination? Weak, man, weak. Pathetic. Josh Rosenau also thinks the DI's statement is lacking in substance, and he links to a New York Times story about the list that points out that the signers include "… 76 chemists, 75 engineers, 63 physicists and 24 professors of medicine…"
"We accept intelligent design as a valid scientific alternative to evolution." "We think the Cambrian Explosion is evidence against evolution." "We think that irreducible complexity is evidence against evolution." "We think that specified complexity is evidence against evolution." The reason they don't ask people to do this is because their "evidence against evolution" IS intelligent design, and they know that the religious underpinnings of intelligent design (and its scientific vacuity) are obvious. Gov. Jon Huntsman Jr. said for the first time Thursday that he'd veto a pair of controversial bills aimed at banning so-called gay-straight alliances in public high schools and at controlling what students are taught about evolution. "If they look and feel like they did in earlier incarnations, I will veto them. We'll have to see what they look like when they reach my desk," Huntsman told the Deseret Morning News following his monthly press conference televised on KUED Channel 7. I have had the sense that Governor Huntsman would veto the Origins of Life bill when he talked about "message" legislation and frivolous bills back in January. But this is the first time he has actually come forward and stated that he is likely to veto this specific bill. Good for you, Governor Huntsman! Mesozoic mammals have been thought to have been small, nocturnal, and confined to a few niches on land until the demise of the dinosaurs 65 million years ago. Most are recorded by isolated jaw fragments or teeth. Ji et al. now describe a Jurassic mammal from China that breaks this mold. The fossil is well preserved, and impressions of fur can be seen on its body and scales on a broad tail (similar to a beaver overall). The animal was fairly large, approaching not quite half a meter in length, and the shape of its limbs suggest that it was adapted for swimming and burrowing. The combination of both primitive and derived features in this early mammal, and the demonstration that mammals had occupied aquatic habitats by this time, expands the evolutionary innovations of early mammals. It's the first evidence that some ancient mammals were semi-aquatic, indicating a greater diversification than previously thought, the researchers said. Modern semi-aquatic mammals such as beavers and otters and aquatic mammals like whales did not appear until between 55 million years ago and 25 million years ago, according to the researchers. The new animal is not related to modern beavers or otters but has features similar to them. The find means that mammals took to the water much earlier than previously expected. Rather than merely living in dinosaurs' shadows, as previously thought, it appears that mammals were actually thriving alongside them (and probably getting eaten by them) for millions of years. I expect many more finds like this to come out of China in the next few years. There are some pristine fossil sites in China that will produce some amazing stuff. I have a photo of the actual fossil find and I am working on getting an electronic copy (being friends with the State Paleontologist for Utah is helpful). The closest I could find online was a drawing of the fossil within an article. What's really striking about the skeleton is the size of the vertebrae in the tail; they are as big as the dorsal vertebrae (backbone). Typical mammals have much smaller vertebrae in their tails. You can also see the imprint of the body fur and the scales on the tail (much like a beaver's tail) in the fossil. If I can get an electronic copy of the photo, I'll post it here. Discussions of any scientific fact, hypothesis, or theory related to the origins of the universe, the earth, and life (the how) are appropriate to the science curriculum. Discussions of divine creation, ultimate purposes, or ultimate causes (the why) are appropriate to the history–social science and English–language arts curricula. Nothing in science or in any other field of knowledge shall be taught dogmatically. Dogma is a system of beliefs that is not subject to scientific test and refutation. Compelling belief is inconsistent with the goal of education; the goal is to encourage understanding. To be fully informed citizens, students do not have to accept everything that is taught in the natural science curriculum, but they do have to understand the major strands of scientific thought, including its methods, facts, hypotheses, theories, and laws. A scientific fact is an understanding based on confirmable observations and is subject to test and rejection. A scientific hypothesis is an attempt to frame a question as a testable proposition. A scientific theory is a logical construct based on facts and hypotheses that organizes and explains a range of natural phenomena. Scientific theories are constantly subject to testing, modification, and refutation as new evidence and new ideas emerge. Because scientific theories have predictive capabilities, they essentially guide further investigations. From time to time natural science teachers are asked to teach content that does not meet the criteria of scientific fact, hypothesis, and theory as these terms are used in natural science and as defined in this policy. As a matter of principle, science teachers are professionally bound to limit their teaching to science and should resist pressure to do otherwise. Administrators should support teachers in this regard. Philosophical and religious beliefs are based, at least in part, on faith and are not subject to scientific test and refutation. Such beliefs should be discussed in the social science and language arts curricula. The Board’s position has been stated in the History–Social Science Framework (adopted by the Board). If a student should raise a question in a natural science class that the teacher determines is outside the domain of science, the teacher should treat the question with respect. The teacher should explain why the question is outside the domain of natural science and encourage the student to discuss the question further with his or her family and clergy. Neither the California nor the United States Constitution requires that time be given in the curriculum to religious views in order to accommodate those who object to certain material presented or activities conducted in science classes. It may be unconstitutional to grant time for that reason. Nothing in the California Education Code allows students (or their parents or guardians) to excuse their class attendance on the basis of disagreements with the curriculum, except as specified for (1) any class in which human reproductive organs and their functions and process are described, illustrated, or discussed; and (2) an education project involving the harmful or destructive use of animals. (See California Education Code Section 51550 and Chapter 2.3 of Part 19 commencing with Section 32255.) However, the United States Constitution guarantees the free exercise of religion, and local governing boards and school districts are encouraged to develop statements, such as this one on policy, that recognize and respect that freedom in the teaching of science. Ultimately, students should be made aware of the difference between understanding, which is the goal of education, and subscribing to ideas. I can't really add anything to this. This is one of the most well-written position statements that I've read. It defines science, it accurately defines facts, hypotheses, and theories, and it states that while educators should be respectful of religious beliefs, those beliefs aren't a valid part of a science class. Science is a distinctive way of understanding the natural world. Science seeks to increase our understanding through empirical evidence. As a way of knowing, science assumes that anything that can be observed or measured is amenable to scientific investigation. By the very nature of scientific inquiry, there are infinite possibilities for further refinement of current knowledge and understanding. Understanding may be derived from sources and perspectives other than science such as historical and logical analyses, art, religion and philosophy. These sources rely upon other ways of knowing, such as emotion and faith. While these ways of understanding and creating meaning are important to individuals and society, they are not amenable to scientific investigation and thus not appropriate for inclusion in the science curriculum. Science relies nearly exclusively on observation and empirical evidence. Since progress in the modern world is tied so closely to this way of knowing, scientific literacy is essential for a society to be competitively engaged in a global economy. Well done Utah! I've noticed that some people regard calling something "unscientific" as an insult. "Unscientific" doesn't mean worthless, it just means that something is not science. "Scientific" is just an adjective. Science is limited to using natural means to explore the natural world, and in fact it is a remarkably successful way to explore the natural world. It's an approach that I find so worthwhile that I decided to make a career out of it. The supernatural is outside the realm of science because the supernatural is outside the natural world. Miracles for example are outside the realm of science. Religion is largely outside the realm of science too, or at least it should be. Having a personal relationship with God, which I think is one of the basic Christian beliefs, is also unscientific, but that doesn't mean it's not true. It's just not subject to scientific investigation. This is one of the reasons I think creationism is generally bad for the Christian community (or any religious community, actually). One of the tenets of organizations like Answers in Genesis of the Institute for Creation Research is basically that Christianity is true because there is scientific evidence for a young earth and a global flood. Now the claims they make are subject to scientific investigation, and they don't really stand up. Therefore, they are a very poor foundation for a relationship with God. Evolution in the broadest sense can be defined as the idea that the universe has a history and has changed over time. Observation of the galaxies, stars, planet Earth, and life on Earth clearly demonstrates that significant changes have occurred. There is abundant and consistent evidence from astronomy, physics, biochemistry, geochronology, geology, biology, anthropology, and other sciences that evolution has taken place. This evidence is found in widely divergent areas, from the geologic fossil record to DNA analysis. I've got mixed feelings about this paragraph. Sure, if you read through the literature about cosmic and geologic history you'll see the word "evolution" used, but that just means change (which afterall, is one of the definitions of evolution). The statement from the BoE kind of says that, but I don't really like their wording. There really isn't a overarching theory of evolution that covers everything from cosmology to biology (this sounds too much like Kent Hovind's caricature of evolution for my liking). Evolution refers only to the origin of biological diversity (not the origin of life, not the origin of the earth, and not the origin of the universe – all of those are separate topics). The reason this annoys me so much is that it leads to statements like "Amphibians couldn't have evolved from fish because we don't know how life first originated." Evolution and abiogenesis (the origin of life) are two separate, but certainly related, fields. Here's an example. Let's say I'm interested in the history of my family in Utah (which would cover the last 150 years or so). If someone were to come to me and say that my family couldn't have moved to Utah from England in the 19th century because we don't understand how Homo sapiens are related to Australopithecines, I’d think their argument was pretty flawed. The study of Australopithecines and their relationship to Homo sapiens is certainly interesting, and it's broadly similar to me researching the history of my family in Utah, but they're definitely not the same thing. If you wanted to refute my claim that my family moved to Utah from England you'd have to prove the records that were kept, etc., were false. Trying to do anything else would be trying to dodge the evidence. Similarly if you want to refute the idea that amphibians evolved from fish, you've got to directly address the evidence (transitional fossils like Icthyostega and Acanthostega, etc.). Anything else is just a distraction. There is little or no debate among credible scientists about whether evolution has taken place. However, since our understanding is still incomplete, there is considerable and productive debate about processes of evolution. Research questions remain, and scientists often disagree about their explanations, as they should. The nature of science encourages ongoing and meaningful investigation of all assertions made by science. Scientific conclusions are tested by experiment and observation as all scientific theories are subject to continued evaluation. laws and withstand the scrutiny and inquiry of the scientific community. The National Academy of Sciences has stated, "Evolution is one of the strongest and most useful scientific theories we have." As a fundamental scientific concept, evolution is a necessary part of science classroom instruction, and it will continue to be taught and progressively refined as a key scientific principle. No complaints there. I am very glad that they point out the difference between the common and the scientific usage of the word "theory". That's very important, and it needs to be reinforced. Teachers should be aware that students bring with them a set of beliefs. Teachers and students should respect and be nonjudgmental about students' beliefs, and teachers should help students understand that science is an essential way of knowing. Teachers should encourage students to discuss any seeming conflicts with their parents or religious leaders. Science teachers should make available to interested parents their planned instruction and the context for that instruction. Again, I have no complaints here. People certainly have the right to reject findings that they think are incompatible with their religion. I think they're wrong, and I think the foundations of their religion aren't very solid, but I'm sure they think the same about me. When I teach about geology I'm not motivated by a desire to make people abandon their beliefs. If someone asks, I'll certainly tell them why I think Young Earth Creationism fails scientifically, and why I don't think that YEC is a very accurate description of the natural world. I will also tell them that I think religion should be outside the realm of science. What I say may conflict with their religious views, but I don't think that's an acceptable reason to avoid teaching a subject. Christian Scientists taking a health class for example, should be expected to understand surgery, antibiotics, etc., even though those practices conflict with their religious beliefs. They don't have the right to insist that health not be taught, or that healing prayer be taught 50/50 whenever health is taught. That's also true for creationism. As a member of the American Geophysical Union I receive a copy of Physics Today every month. I have to admit that I don't usually read it. I made an exception this month, and I'm glad I did. There was a really interesting article on an experimental set up at the University of Wisconsin-Madison that acts as an analog for Earth's magnetic field. Unfortunately the article is subscription only, but the research group that's discussed in the article has a pretty nice website (The University of Wisconsin-Madison Dynamo Experiment". The earth's outer core is composed of molten iron, and motion in this liquid outer core generates the earth's magnetic field. There's still quite a lot that's not known about the processes that generate the magnetic field, and those processes can be hard to study. There are two main approaches that geophysicists have taken: 1) using computer models, and 2) trying to simulate the conditions that exist in the outer core. There are quite a few geophysicists who use computer models to try to figure out what's going on in the interior of the earth. Most of the ones I know try to simulate the mantle, although there are some that deal with the inner and outer core. The mantle is around 2900 km thick, while the earth's crust is a measly 70 km thick at most, and is usually a lot thinner. So people who model the mantle have to deal with a really substantial volume of the earth. This can be a problem for computer models. The larger and more complex the model becomes the more computation time is needed. This isn't too much of a problem in the mantle because while the mantle is really big most of the features in the mantle that people are interested in are really big too. Things like mantle convection cells, mantle plumes, and subducting plates are all at least 100's of kilometers in size. That's definitely not too complicated to work with given the power of modern computers. Unfortunately for computer modelers the story is more complicated in the outer core. The Physics Today article points out that the magnetic structures in the outer core are at least a few hundreds of kilometers in size, small scale turbulence within those structures (on the order of 10m in size). This means that a realistic model would have to have 10^15 grid cells (10^12 = 1 trillion, for way of comparison). Even with supercomputers that number of grid cells would result in models that have computation times that are too long to work with. This is where the people who build machines to simulate outer core conditions really come into play. It's not possible to build machines that completely mimic the outer core, which is composed of incredibly hot and incredibly dense liquid iron. The temperature at the top of the outer core is something like 3000-5000 degrees C, while the pressure is ~100+ GPa (1,000,000 times the pressure at the surface of the earth). Fortunately there are things that behave like molten iron but at much lower temperatures. The properties of liquid sodium at 98 degrees C are much like the properties of iron in the outer core. That temperature is definitely low enough to work with. The team at UW built a hollow sphere 1 meter in diameter that they fill with liquid sodium (as an aside, sodium doesn't react well with water, so it can be a tricky material to work with). They use propellers inside the sphere to simulate turbulence in the outer core. Fill the sphere and turn it on, and presto, you've got a working analog of the earth's core. The cool thing is that turbulent flow in the sphere can generate a magnetic dipole, which means a magnetic field with a north and a south pole, which is just like Earth's magnetic field. The UW team hasn't performed enough experiments to fully understand what's going on inside their sphere, but it's a really promising start. Special thanks to Geology News for pointing out this feature. stress that no scientific theory, hypothesis, or instruction regarding the origins of life or the origins of species has been indisputably proven; and do not endorse a particular theory or hypothesis regarding the origins of life or the origins of species. The House education committee recommended the bill to the full House (by a 7-6 vote) and it is scheduled for debate and voting early next week. The changes to the bill in the House have actually widened the scope of the bill, but have also rendered it practically useless. The original bill stated that there was no scientific consensus on the origin of life or the origin of the human species, and that the State does not endorse any particular theory on either subject. It also required teachers to inform students of this. The new version of the bill states that no theory (or idea or hypothesis) on the origin of life or the origin of any species has been indisputably proven and that the State does not endorse any particular theory on either subject. It still requires teachers to inform student of this. I am all for encouraging students to critically examine any scientific theory. That way they can draw their own conclusions based on the evidence. The question then becomes, why single out the origin of life (abiogenesis) and the origins of species (evolution)? Why does this not apply to all scientific theories. The answer is obvious: the legislators (especially Sen. Buttars) feel that evolution and abiogenesis threaten their (and some of their constituents') religious beliefs. Given the past statements by supporters of this bill (see my previous post on this bill), it seems extremely unlikely that this bill would stand up to the inevitable constitutional challenge should it pass. Your letter dated February 11, 1957, has been received. On the subject of organic evolution the Church has officially taken no position. The book "Man, His Origin and Destiny" was not published by the Church, and is not approved by the Church. The book contains the expressions of the author's views for which he alone is responsible. A little background on the book "Man, His Origin and Destiny" may be helpful. The book was published Joseph Fielding Smith (who was president of the Quorum of the Twelve Apostles at the time*) in 1954. The book came out strongly against evolution and was the basis for the article on evolution in "Mormon Doctrine", a book compiled by Smith's son-in-law (who was also an Apostle). "Mormon Doctrine" was not published by the LDS church and is not the official doctrine of the LDS church. While members of the Quorum of the Twelve Apostles hold a position of high authority in the LDS church, they do not have the authority to dictate church doctrine. Only the President of the church has that authority. "Mormon Doctrine" is so widespread among members of the LDS church that most of them have assumed that the section on evolution represents the official position of the church, when in fact it does not. Interestingly, since the official position of the LDS church on evolution is that it has not taken any position on evolution, it leaves a lot of room for individual interpretation. You can believe the literal creation story from Genesis and be a member in good standing. You can believe completely in evolution and be a member in good standing. This has lead to some extremely interesting and enjoyable conversations between myself and other LDS church members on the subject. As hard as I've tried I just can't understand how people can really think that my belief in evolution is threatening to their belief in God. Evolution says nothing about God. Religion teaches us why, science teaches us how. *Click here for more information on the organization of the LDS church. In this entry I blogged about a great letter to the editor in the Herald Journal propmpted by an earlier pro-intelligent design letter. I just came across a blog that has the text of the original letter. I wasn’t going to read the anti-intelligent design Soapbox article by Richard Criddle until I noticed the very last line that stated he was a member of the LDS Church. I wondered why a member of the LDS Church would be against intelligent design, so I read it. It quickly became apparent that he does not believe in the creation as expounded in the scriptures or by our prophets. That led me to wonder why he wants to be identified as a member of the LDS Church. I understand those who don’t keep the commandments who want to be identified as members. All of us have our various weaknesses. I also understand those who are less motivated to attend on a regular basis. Some are not as motivated as others. This letter is not about either of those groups. One of my favorite things is to talk to others about what they believe and why. People’s beliefs are based on what they consider to be facts, their own logic and their feelings. The key to understanding others is to understand what they believe and why. With that in mind, this letter is to those who don’t believe that President Hinckley is a prophet and who still want to be considered a member of the LDS Church. The LDS Church has come out strongly on a number of issues. Three of those are: God created this earth and all things on it; homosexuality is a sin; and abortion is wrong. This letter is not addressed to those who disagree with those stances, it is addressed to those who disagree and still want to be considered members of the LDS Church. Do you believe that President Hinckley is a prophet except on evolution, or except homosexuality, or except some other point? How is that possible? Prophets speak for God, so is God also wrong? To me, there is a huge difference between those who struggle with, for example, a Word of Wisdom problem and those who make a considered decision that the prophet is wrong. Again, this letter is not addressed to those who have weaknesses or who have decided to leave the LDS Church. The belief that the president of the LDS Church is a prophet is probably the most key belief that makes the LDS Church different from every other church. So, if you don’t believe that he is the prophet of our savior, Jesus Christ, why would you call yourself a member of the LDS Church? This letter is a sincere request to have someone explain to me why this group would want to be identified as members of the LDS Church. What benefit do you expect to receive when you don’t believe? The U.S. Geological Survey has just released a new publication on earthquakes, titled "Earthquake Science Explained: A series of ten short articles for students, teachers and families". If you are interested in earthquakes or how geologists study them it is a nice booklet (18 pages) with lots of diagrams. It is available as a free download from the USGS. The document is in PDF format (1.2 MB).